Regenerative Medicine is an innovative branch of medicine focused on restoring the body back to a healthy functional state. Placental tissue has been used in a wide range of applications in regenerative medicine for the last century because it encompasses so many therapeutic benefits. Revita is dehydrated donated human placental tissue obtained from healthy, full term preg-nancies. 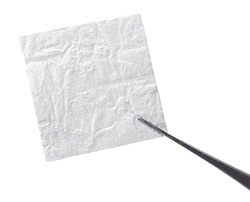 Revita is used as a sheet placed over dermal defects, designed to cover and protect damaged skin throughout the healing process. Revita retains the complete intact membrane, maximizing the therapeutic proteins and growth factors. As the body ages, this wound healing process slows, but new technological advancements in wound treatment may help restore optimal healing. 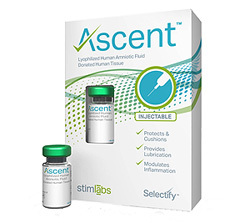 Ascent is an injectable solution designed to cushion, protect, lubricate, and reduce inflammation in fluid environments, such as joints and tendons. It is derived from amniotic fluid, which contains natural components that support the fetus as it grows and develops. Using a patent-pending method for processing amniotic fluid, Ascent captures these unique components in a single solution. Joints and tendons degrade over time from a range of factors including mechanical overloading, age, and genetics. These factors result in a complex series of biological events that cause inflammation and degeneration. In joints, this causes cartilage breakdown and a change in synovial fluid composition. In tendons, this causes collagen breakdown and microdisruptions. Ascent contains a unique array of natural biomolecular components such as epidermal growth factor and fibroblast growth factor that counteract these effects to provide relief and revive the anatomical structures. The procedure for injecting Ascent is very similar to a simple steroid injection. It is quick, easy, and unlike other regenerative therapies, doesn’t require an invasive procedure. The injection site is cleaned, anesthetized and injected - all in less than 10 minutes.